This team’s Defense is just so consistent it’s unreal. As far as fantasy goes they should be the 1st picked defense every year. With that crazy Polynesian rocket in the defensive backfield I don’t foresee this defense going sour anytime soon. 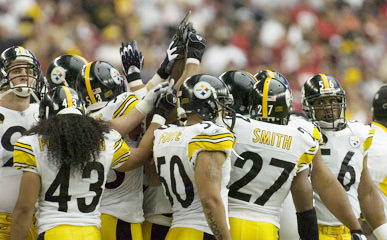 This team has LB’s in spades, returning Lamar Woodley,James Harrison and James Farrior. This team as always, seems to be solid. Farrior is a little bit on the older side, but they have so much young talent at LB and such a great system, I just don’t see it mattering. Casey Hampton will be the enormous anchor on the defensive line, and we all know how good “big snacks” is at that! This Team has one of the greatest defensive lines ever assembled on paper, without a doubt. 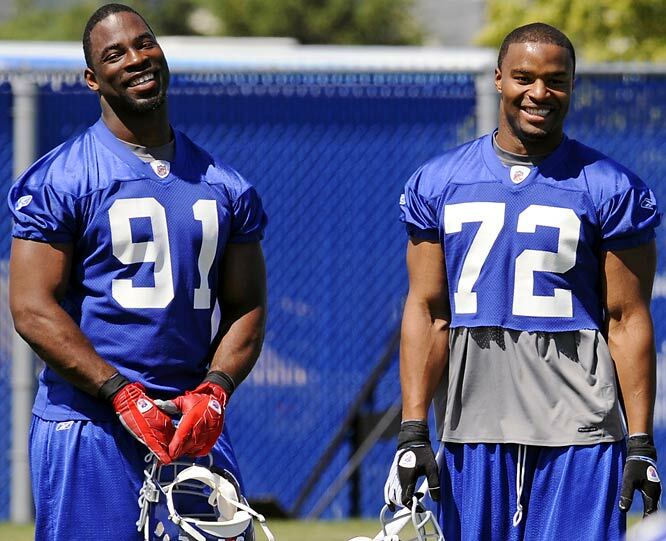 Osi Unmenyora and Justin Tuck are maning the ends, once again putting 2 pro-bowl Defensive ends on the field for the Gmen. Mathias Kiwanuki once again will move back to DE, giving the Giants 3 monster pass rushers to filter in and out as they please. The New York Giants also have signed Seahawks great Rocky Bernard and ex-Cowboy Star Chris Canty to add depth to the giants already positive DT situation. They will join current starters Fred Robbins and Barry Coefield at DT during this years camp. They have also added Micheal Boley and Rookie Clint Stintom to sure up the once ailing LB core. BIG AL is the final word on this debate. This guy is a monster, and he should fit in well here. They have resigned Deangelo Hall. They however lost shawn springs to NE but they still have Veteran CB Fred Smoot. They also will enjoy the employment of the hard hitting Safety LaRon Landry. Brian Orakpo may be a huge asset this season or he might not make a big impact, we will have to wait and see. If Orakpo steps up this season this may the toughest team to run against in the NFL this season. With Jared Allen and the Williams boyz returning on the D-line it is not hard to see why this team is ranked as high as it is. With E.J. Henderson and his younger brother Erin it’s not suprising that the Vikings are the best team against the run only allowing an average of 76.9 rushing yards per game last year. They actually ranked better than the steelers against the run. With the Loss of Darren Sharper I expect a drop in the secondary that will be noticable. They still have Antoine Winfield playing corner but there are some holes in the secondary without a doubt! 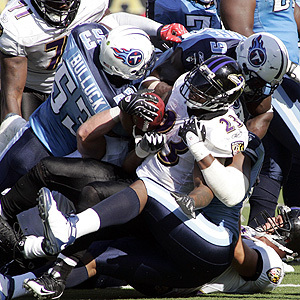 The Titans were ok without Big AL. They have a great core and should be great once again this year. They have signed Jovan Haye who played DT on Tampa Bay last year in hopes of replacing Albert Haynesworth. This team returns Interception league leading FS Micheal Griffin. They also have Veteran LB’s Bullock and Tulloch. This team should produce stats, it will be interesting however to see how this team, which gave up the 2nd least amount of points last season, reacts without Big Al. 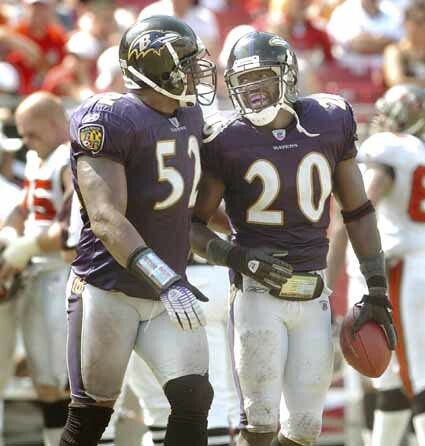 Ray Ray and Terrell Suggs are together again in the Ravens LB core. This team just forces turnovers. They Led the league last season with 26 Interceptions and I see no reason why that would stop anytime soon. Ed Reed, The NFL’s best ball hawk, is returning to the secondary along with Samari Rolle. The Ravens have also signed CB Domonique Foxworth to help replace Chris Mcalister and Corey Ivy. This team also has a decent D-line which includes atheletic NT Haloti Ngata, making them a tough team to run against. This is just a hunch, I have no reason execpt that they recently have signed S Darren Sharper and DE Paul Spicer. They have also resigned Johnathon Vilma who will join Scott Fujita in the LB core. The Saints drafted Malcom Jenkins who is thought to be the best DB in this years draft, so he may play a big part in this defense. Personally this team has been pretty bad over the past couple of years, so I just feel they are due. I mean when your Offense puts up the numbers there’s does eventually your defense is going to play well and allow you to win! Jets are built to play defense now. Chris Jenkins is a monster and with Rex Ryan coming in one would expect a tough defense. Bart Scott will be joining the Jets LB and might bring that tough Ravens mentality with him. This team can be a fantasy stud on any week, just ask the Rams, who allowed this defense to have 2 interceptions, 2 sacks and 3 fumble recovers with one of them being returned for a TD. Just trust in Rex Ryans system and choice in Personal if you are a Fantasy owner. Adrian Wilson and Darnell Dockett are freaking awesome. This team stepped up big last offseason and I don’t expect that streak to end any time soon. With Linebackers Clarke Haggans and Carlos Dansby returning this defense should be tough. Also Dominique Rodgers-Cromartie should be a top CB in the NFL this season. Tagged: Best Defense of 2009, Best Fantasy Defenses, Best NFL Defenses 2009 season, Defensive Rankings for 2009, Giants are the best defense, Steelers are the best defense, Top Defense in NFL for 2009, Who has the best Defense in NFL, Who has the Best NFL defense? I love the list but I think New Orleans is ranked a little too high. This list is pretty accurate accepte the eagle should be somewhere up there 4 sure did u see themm play last week ?????????? You really picked all the sleepers right but you definitely picked up the busts with the Steelers and the Giants !